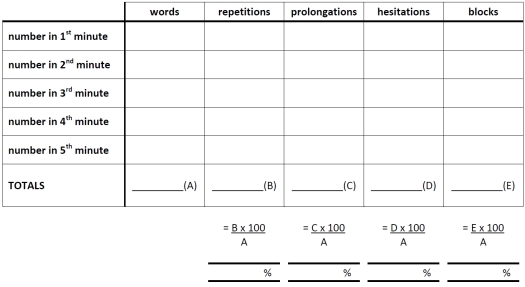 This is a five-item form designed to provide a baseline measure of the frequency of occurrence of four stuttering characteristics: repetitions, prolongations, hesitations and blocks. It, therefore, provides a measure against which future speech performance can be compared. A five-minute audio recording of the client in conversation with one other person is required. A simple count of the number of words used by the client in each successive minute of the conversation is made. Then the number of repetitions, prolongations, hesitations and blocks in each successive minute is determined. This helps to identify increase or decrease in the number of characteristics as the client settles into the conversation. Each characteristic is scored as a percentage of the words used. The form can be completed either by the client, the clinician, or client and clinician together. An explanation of each stuttering characteristic is included to assist self-rating. Baseline measures of this type often do not show significant change over short periods of time and they are most usefully used in conjunction with other assessments that measure such things as the client’s own perceptions about their stuttering behaviors and the impact of these in meeting the needs of daily living. Simple counts of words and features that are translated into percentages. No standardization or inter-tester validity is claimed. Only one version (Version 2011-1) is available. 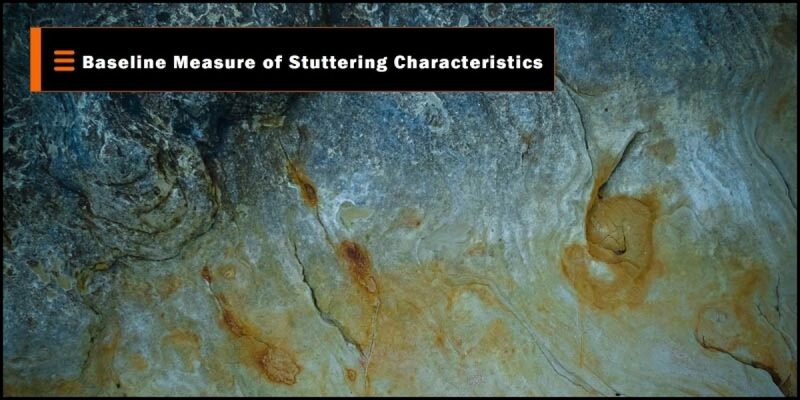 Below is a summary of the types of stuttering features you might find in your speech. Not every feature will appear in your speech. consonants, e.g. wwwww-what is it? A block happens when two parts of the mouth (e.g. lips, tongue and teeth) come together with too much force. For example, when the two lips come together to form the sound /b/ as in the word ball, instead of separating the lips quickly and easily they are held together too tightly. The speaker finds it hard to release the contact between them and a lot of tension can build up before they are finally separated. In severe cases blocks can last several seconds.